Country View Challenges: Hazel's gone all out summer colours! Hazel's gone all out summer colours! Hi, my name is Hazel Agnew and I have been crafting for a relatively short while! I have always dabbled with art, and began experimenting with this altered art style when I retired from work recently! I have found so much inspiration from fellow “artists” on Facebook and Twitter and several Blog challenges…not least Countryview Challenge which has an abundance of talented designers with a wealth of different styles. I am most comfortable with messy art and work quite spontaneously; often not knowing where the mood will take me! I get ridiculously excited while crafting and my long suffering husband has adopted quite a few encouraging phrases when a piece of work is thrust under his nose! I was over the moon to be in the Top 3 of the CountryView challenge in May. It was my very first award of any kind. 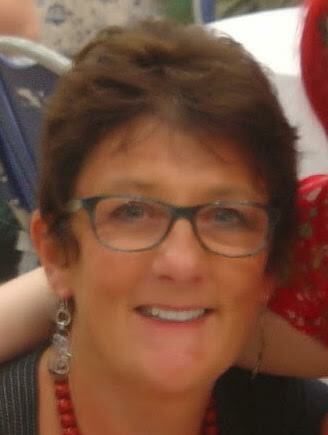 So, the topic for August is Summertime, and chosen by the extremely talented and inspirational Alison Bomber. It was Alison that encouraged me to join in with the Country View challenges! I decided to play with the new stamps by Emma Godfrey which are holiday themed. They are so easy to use for this theme and I decided to use very bright summery colours. I used the Paperartsy fresco paints by Lin Brown which have Bougainvillea in them! A colour that is now a must have, plus Glass Blue. 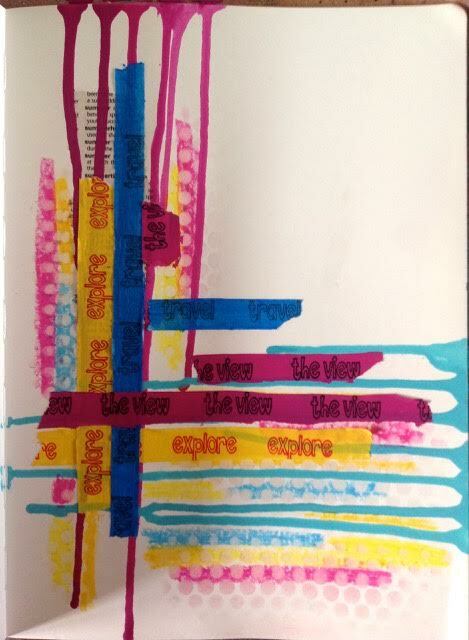 I worked in my journal; using drippage; Portfolio Pastels through a stencil; making washi tape; painting flowers and adding a recent holiday photo. What a fabulous project Hazel, fab colours and great composition, a beautiful project - thank you! Come on folks, time to get a shimmy on if you haven't joined in already as we're almost at the end of the month! We'll be back on Saturday with our last post and one certainly not to be missed! 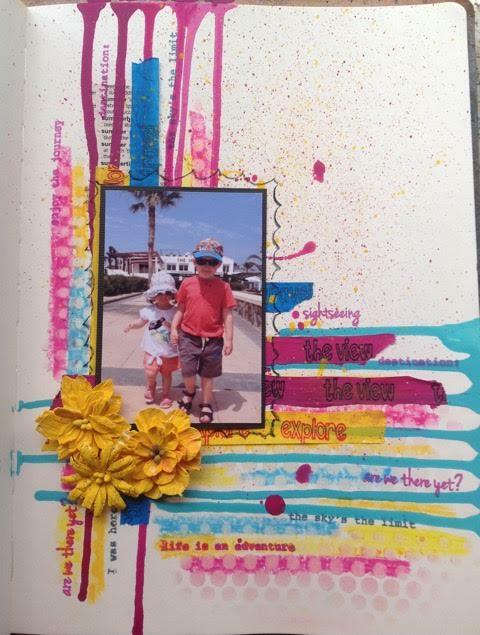 What a fabulous bright bold and summery look for your layout - and I love the photo too! Lovely to have you with us this month, Hazel. Well done hazel!! Gorgeous fun colors! Brilliant layout, Hazel! Congratulations on your Guest Designer spot--you rocked it! !